Let me fill you in on my GIN filled friday night. 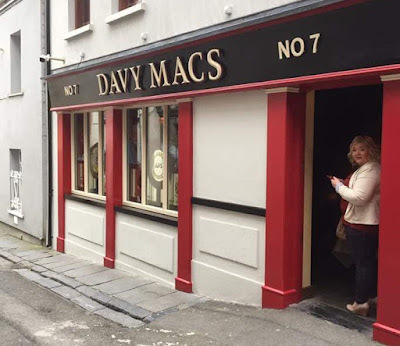 Davy Macs Waterford Voted Munsters "Best Bar in Waterford" were holding an event with The Shed Distillery home to the coveted Drumshanbo Gin. My partner entered a competition on facebook and lucky enough his name was pulled out. My knowledge of Gin Distilling is becoming one to be revelled with. Friday night quickly rolled around and I was eagerly awaiting my learning experience from The Shed Distillery with baited breath. We arrived around 7 pm and went into the bottom bar. We were greated with a Gin menu of over 100 types. Without hesitation we chose a Drumshanbo Gin & Tonic served with Elderflower Tonic, some fresh raspberries and a slice of grapefruit. This gin 100% challenges the preconceptions of what gin should taste like. It is delectable, and easy on the palate. The time quickly moved on in that little bar which is a world away from Waterford. When inside it feels like you are in a busy old time bar settled in the busy streets of New York. This was the amazing scene when we went to head upstairs. Drumshanbo Gunpowder Irish Gin is the latest creation of Pat Rigney, the man who came up with Boru vodka and Sheridan’s Irish Cream Liqueur. Made in his new distillery in Drumshanbo, Co. Leitrim. "And it was here that his curious mind, filled with the great oriental traditions of distilling fruit, herbs and botanicals, got to work. He created The Shed Distillery of PJ Rigney, with its medieval copper pot stills, and began a quest to fuse oriental botanicals with the local Irish ones. As it turned out, they got on very well indeed. The result of this passionate exploration is Drumshanbo Gunpowder Gin – unique, extraordinary and remarkable as the elusive creature PJ has occasionally glimpsed in the fields, the Drumshanbo Jackalope." Sean MacGabhann was our host for the evening, he enlightened us to the story behind that iconic blue bottle based on apothecary bottles and the history behind Drumshanbo and its creator PJ Rigney. One of the most populated spirit ranges at the moment is gin, and while there are great gins out there, relatively few are however successful in pushing the boundaries of flavour beyond the classical botanicals. The most usual production method for gin is to distill botanicals, such as juniper, coriander, citrus peel, cinnamon, almond or liquorice, with neutral grain alcohol. Making gin is like flavoring vodka, except that botanicals are always natural. Drumshanbo is an Irish gin made with juniper, angelica, orris, caraway, coriander, meadowsweet, cardamom and star anise as well as vapour infused oriental lemon and lime, fresh grapefruit and gunpowder tea! On our tables were little pots of the tea and some Drumshanbo to taste. I have become accustomed to sipping gin in order to let the flavours illuminate my senses. Sip the gin and swirl it around your mouth to assess the primary taste. Let the gin rest on your tongue, then swirl it around your mouth to analyze the flavours. The first sip should be pleasant, warm and smooth with a subtle taste of juniper. With the Drumshanbo you get the subtle taste of juniper along with the citrus. It really is a delightful taste. Von Hallers is the second gin which is produced by the Shed Distillery. In Göttingen, Carl v. Hardenberg Jr. curates the select, hand-picked botanicals and shares his rich family knowledge of spirits and liqueurs with the unique distillery established in deepest rural Ireland by PJ Rigney. The result of which is a extraordinary gin which is aromatic and distinctive. Once our minds were submerged with the knowledge of gin distilling it was time to sit back relax and enjoy the rest of the night. Sean was on hand for any questions about the product or the brand. Sinead and her team at Davy Macs served up some delightful treats. The latter part of the evening was spent enjoying some Drumshanbo cocktails which were especially created for the evening. Ireland’s favourite Irish cocktail is the Apple Market featuring Drumshanbo Gunpowder Irish gin and created by Waterford Bar - Davy Macs. The Cocktail of the Year "The Applemarket" was of course on the menu along with some other alternatives. Drumshanbo and Von Hallers are available from Waterford's Finest Gin Bar Davy Macs on John's Avenue. Michael, Seamus, Sinead, Alan & all the team have put major effort into making this bar the hottest spot on Waterford Tiles. It really is a haven. If you get the opportunity to pop in and sample some of their delectable cocktails and over 100 different types of gin then it is a trip worth making. Thanks to Sinead and her team for a wonderful evening and to Sean from The Shed Distillery for a fantastic lesson on all things Drumshanbo.